Buying cheese from a cheese monger is a new experience for me and one I really recommend. I love that you can take time to taste, savour and compare cheeses so you find one that is right for you and your cheese-eating occasion. And ever better sometimes you get to geek out with a fellow cheese person. I had one of those delicious experiences last week with Ludovic Avril from Le Marche Francais. This is a little hidden gem of a shop, tucked upstairs in the Woolstore at 262 Thorndon Quay. It is becoming a regular pilgrimage. I always look at the raw milk cabinet, being enough of a cheese snob to ignore the other which houses the pasteurised cheeses. And this visit I wasn’t disappointed. For there looking out at me was a magnificent log of wrinkly, mould covered intrigue. What was this beauty? Housed in its industrial plastic cloche at twenty bucks a pop it was going to be a risk, because it didn’t look like I could sample it. And there in lies the beauty of the cheese monger or more aptly fromagier. It was a Sainte-Maure de Touraine and M. Avril was more than happy to prise open the plastic cage with its carefully constructed wooden base and cut it in half. We both reveled in its wonderful aroma – farmy, barn and most cerainly goaty! Then not content with letting me taste just one of his fine cheeses, he reached and in and pulled out his goats brie for us to taste, together. This togetherness is what is really wonderful about Le Marche Francais – he tastes too, and in a moment of shared experience you both try to describe the subtle and complex flavours as they move and change in your mouth before disappearing off your tongue. 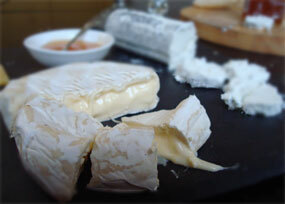 We decided the goat’s brie was a beginners goats cheese, almost too delicate and lacking in character, though perhaps to be fair, it had just been overshadowed by the previous more forthright and complex cheese. Our next taste was a third goats cheese – a blue-grey covered pyramid whose name I didn’t catch, it looked like a Valencay but I can’t be sure. What was wonderful about this cheese was the insight M. Avril gave me into his aging process. First we tried a young piece, cave-y on the nose, definitely goat, but without the barny farm of the Sainte Maure, it was smooth and delicious. Next he offered me a second taste, this time from a block that he was experimenting dying out a bit more, in an effort to develop the flavours. Whilst less goaty on the nose, it had certainly developed more complexity than the younger piece. I chose the Sainte Maure, confident I had a perfectly aged cheese, that was just right for my palate and the palates of my guests. It lasted the week in my fridge and delighted my friends. This couldn’t be said for the ammonia-ridden, over ripe NZ goats cheese I bought from Moore Wilson’s a few days later. Unpalatable for my guests, the sterling work of the cheese-maker is wasted by industrial store practices. Oh for more cheese-mongers to up the supermarket’s game! So thankyou Marche Francais, I was honoured to get an insight into the alchemy that is cheese selling. You can’t get this experience in a supermarket no matter how flash. I can’t wait to go back.